Howie is using Smore newsletters to spread the word online. 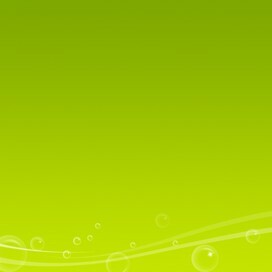 Plans starting from just $8.00! Netflix offers unlimited DVD rentals for a standard fee per month. For renting additional HD movies a standard rate can be added to your monthly bill or you can subscribe to our premium plan for unlimited viewing content. The y-intercepts for each line are the standard fee per month. 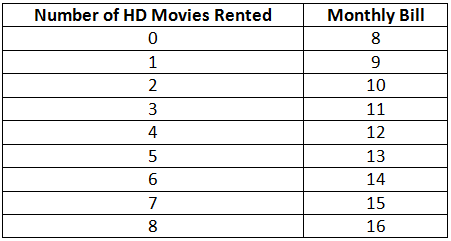 The number of HD movies rented is the x variable. The bill after one month is the y variable. Does it Satisfy Both Equations? At this point it does not matter which plan saves you more money, the cost of each plan is the same when you rent 8 HD Movies from each plan. Q: Which rental plan should I get? 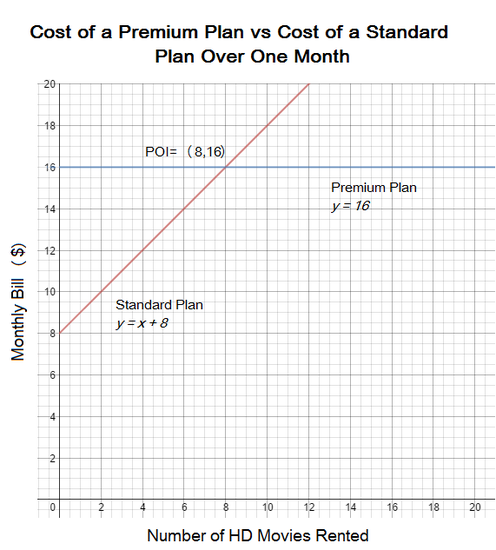 A: If you plan on renting more than 8 HD movies over the course of a month then the Premium Plan is right for you. If you are going to rent less than 8 HD movies then go for the Standard Plan. If you know you are renting 8 HD movies then it doesn't matter which plan you get as they both cost $16.00 when 8 HD movies are rented.